We enter, they quickly seat us, and they bring out 5 small bowls of soup, a platter of sesame dough sticks, a pot of rice, and glasses of water. The dough sticks weren't very good, as they were kinda.... unleavened, for lack of a better word. The soup was egg-drop-ish with carrots and tofu. I enjoyed the temperature at which it was served, but otherwise it was kinda "eh." At some point, a pitcher of water also appeared at the table, which allowed us to refill our (small) glasses whenever we needed. There was a station where you could get eggrolls, which were good but kinda hollow... as in 60% of the eggroll was the wrapping. 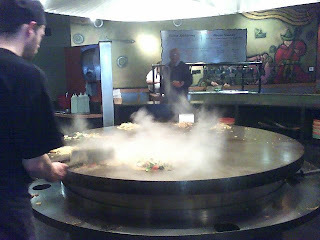 We headed up to the buffet line, where you put ingredients into a bowl and then give it to the cook to stir-fry, so-to-speak. There was beef, lamb, pork, tofu, and chicken. There were noodles. Broccoli, baby corn, cucumbers, pineapple, cilantro, green onions, onions, green peppers, celery, and probably some other things came next. Finally, you added on your sauces. There were 7 or 8 different ones, and there were "recipes" on the wall to indicate how to mix them to create the "original," "chef's choice," and "spicy" combinations. Unfortunately, we were unsuccessful in creating a good "spicy." I made the "chef's choice" on my first run, while several others tried "original" and Andy tried making a double batch of "chef's choice." Neither Andy nor I even tasted a sauce, which was strange when you consider how much minced garlic went into the mix. We chatted about why nothing was spicy, and before you knew it we were on our second trip up. JB was able to create a good mix, but he had very few vegetables on his plate, so I think the meat just soaked up the spice. Jim and I ended up with "barely taste it" mixes (I added chili oil to mine, he added chili sauce). It turned out to be a good thing that there was a pitcher of water on the table, as I had to add soy sauce to both my dishes in order to make them tasty, and then they were rather salty, LoL.